Germany is rightfully known for its Riesling. Not only is Germany by far the world’s biggest producer of the noble grape; it’s also the international benchmark for Riesling styles and excellence — from delicate, shimmering off-dry Kabinetts and complex, dazzling dry versions, to mind-bending dessert wines. And, arguably, the apex of German Riesling is in the cool-climate, slate-rich Mosel region. Around 60% of Mosel production is Riesling, and some 91% is white wine. 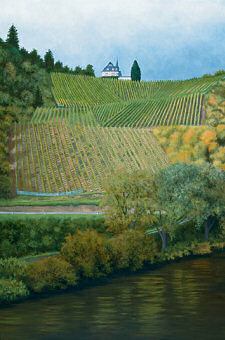 Reds are clearly not the priority along the steep river banks of the meandering Mosel River. But despite the small quantities, a tip from the wine geeks at Crush Wine and Spirits — my go-to wine shop in New York City — showed that, in the right hands, Mosel reds, specifically Mosel Pinot Noir, can be compelling. The wine? The 2011 Stein Spätburgunder trocken (dry Pinot Noir). I recently picked up a bottle of the Stein Pinot Noir ($29.99) for a dinner we hosted upstate. The Crush folks had dubbed it “Red Riesling”, as the Stein’s Pinot Noir is grown and vinified more like a Mosel Riesling, i.e. grapes grown on steep, slate-laced vineyards, and having rested 15 months in neutral, 1,000 liter wood barrels (Moselfuders). As advertised, it makes for a singular, mouth-watering expression of German Spätburgunder that’s great slightly chilled, perfect for a late summer repast. In the glass, the Stein Pinot Noir was a star bright, translucent ruby. Highly aromatic, it sported clear dark cherry and plum fruit character, as well as some high tone herbal (Thai basil) and mineral lift. Light-bodied, but full of nervous energy and structure, the pretty fruit aromas played back fully on the palate, together with a hint of spice, herbs and a dark (dare I say, “slatey”) mineral finish. The Stein blew our guests away: “Oh my God, this wine is so good,” was the immediate comment. 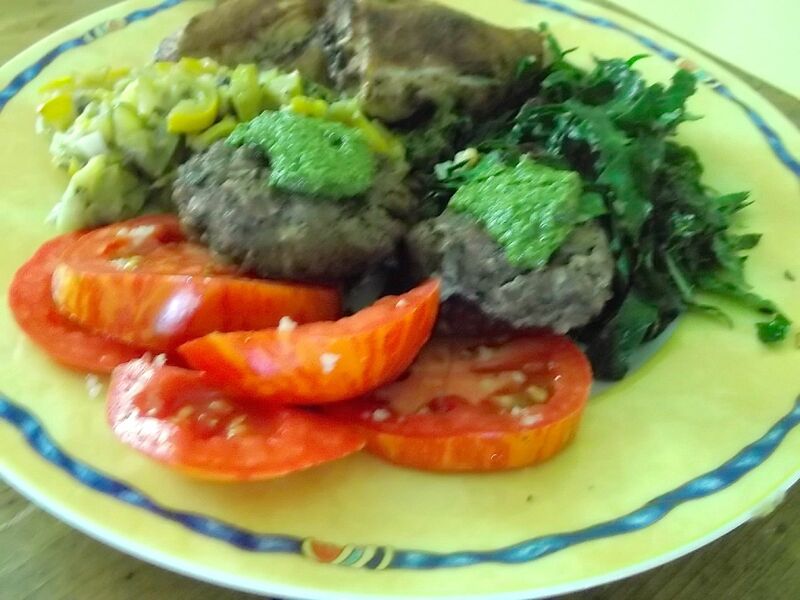 Needless to say, the bottle disappeared quickly, but not before proving itself a seamless dinner partner for our summer spread of raw kale salad, grass-fed beef burgers redolent with Provencal herbs (sage, basil, oregano), grilled cinnamon chicken, day-fresh sweet corn, heirloom tomatoes and sautéed summer squash. It’s an incredibly drinkable and versatile German Pinot, with a unique Mosel imprint. 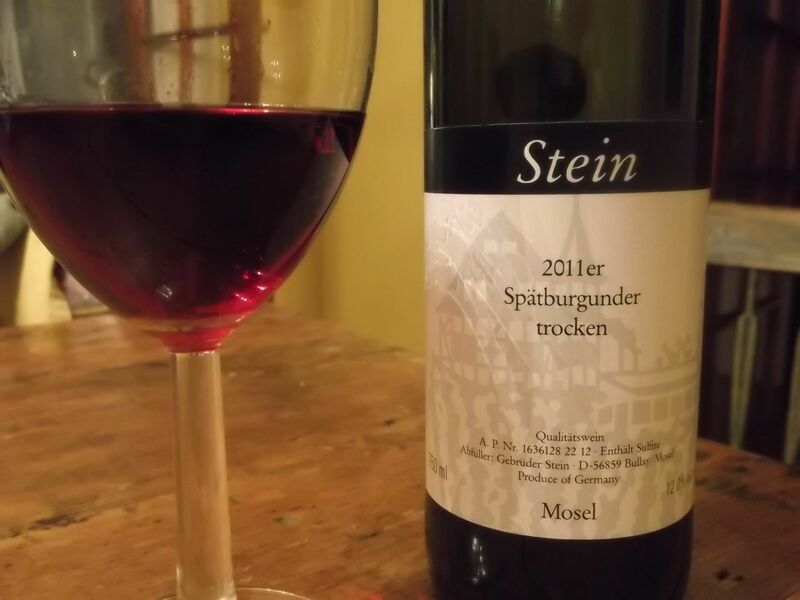 This entry was posted in At Our Farmhouse, Hudson Valley, New York City, Wine, Wine + Food and tagged 2011 Stein Spaetburgunder trocken, Crush Wine and Spirits, German red wine, Mosel Valley, Pinot Noir. Bookmark the permalink.